Don’t feel like reading? Listen to the podcast here, or the video (above)! “The Greeks could do anything but live in peace with one another.” So opens E.H. Gombrich’s discussion on Greece and Sparta in his brilliant A Little History of the World. According to him, Greeks have conquered the mysteries of the universe, the state, and the soul, but history has drawn battle lines between us at times WHEN there could have been bridges. But for every wedge that drives us apart, there’s a moment of magical unity. These are the times that brought us together out of pride and admiration for where we were as Greeks, how far we’ve come, and how much we can look forward to. Anyone who feels something for Greece has a favorite moment. Maybe you remember the cheer from local Greeks that lit up the Australian sky after the victories of tennis champions Stefanos Tsitsipas and Maria Sakkari. Perhaps you remember the songs and dances that painted Greece in the national stripes the night the Greeks won the 2004 UEFA Euro soccer championship. Maybe you have admired Yorgos Lanthimos’ rise as a director from Athenian auteur to international Favourite. Like Luis Buñuel (an earlier director whose sense of mischief he shares), he cast his surreal spell over the world. I love that word, not for its sound, but for its meaning. It’s the solidarity you feel with those you share a world with. Camaraderie is borrowed from the French word comrade, which addresses any kind of ‘fellow’, ranging from fellow students, members of an organization, the armed forces, and so on. What if we Greeks could bottle up the camaraderie from those unifying moments? What if we could use it to encourage a sense of teamwork and fellowship that we can use to build Greece’s brightest possible future? 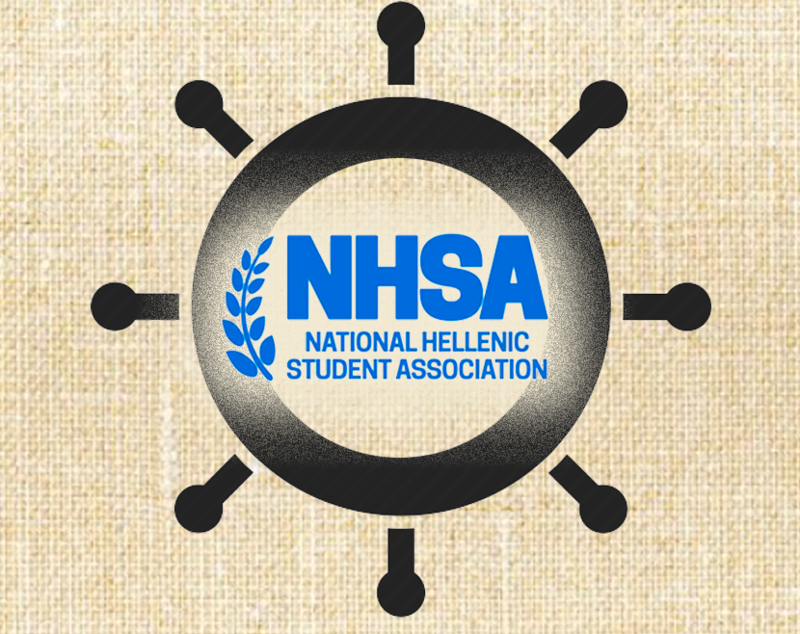 The National Hellenic Student Association of America (NHSA) is an organization that empowers young people with Hellenic roots by bringing them together through its various initiatives. Most importantly for me, NHSA operates through a powerful sense of teamwork, as I have witnessed as a proud member of their marketing team. I wonder what Gombrich would have said about us. NHSA was built from the ground up by Hellenic-Americans. They organize bi-annual conventions and events of a social and professional nature, and partner with other organizations to promote “…Hellenism, education, mentorship, and overall unity of the Hellenic community.” Unity, of course, is the operative term here. If you walk the streets of New York’s Astoria, Chicago’s Greektown (the host of the latest successful convention) or America’s other historically Greek neighborhoods, you may see a full spectrum of our culture on display. 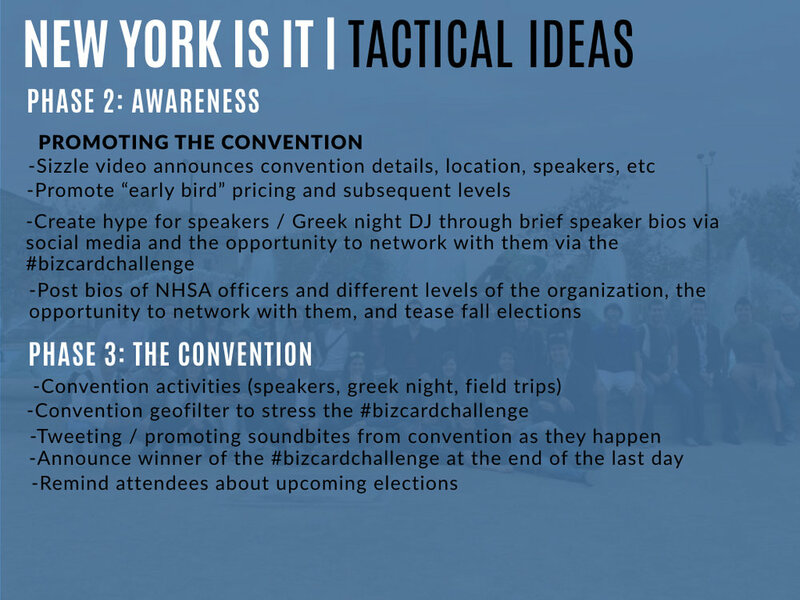 In NHSA, members always ran the full gamut of the Hellenic experience, which proved to be key to the collective culture of our organization, and common ground was our secret weapon for the upcoming convention we would host in Fall 2018 in New York City. We overcame our greatest differences, starting with geography. 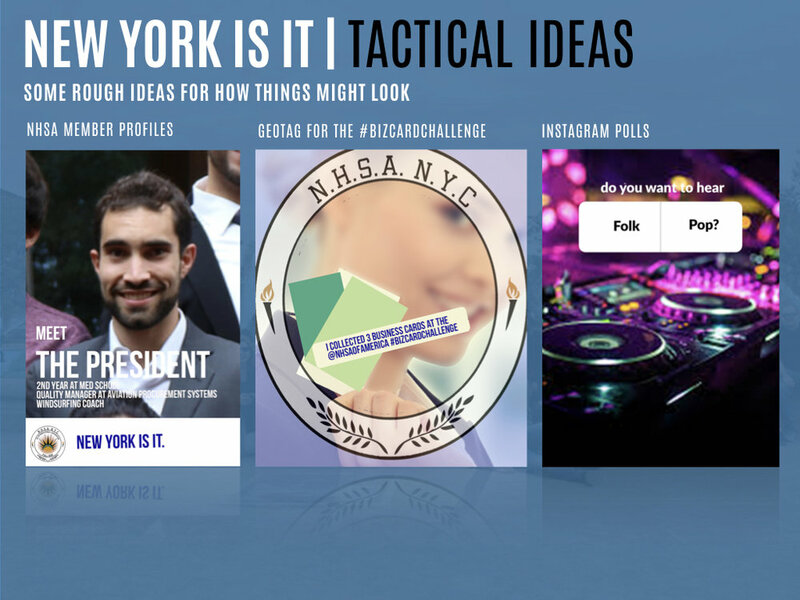 When I received the call of duty to be NHSA’s Marketing Strategist from my friend and then-president Alexander Thomopulos, part of my initiation was to be added to the cloud-based project management software we use internally. I felt like I had opened up a microcosm, like the self-sufficient communities of tiny people in the film Downsizing, directed by Alexander Payne (who is of Greek descent). What I saw there was an elaborate global ecosystem of work with members as far flung as Toronto, Canada and Athens, Greece. Meetings would be announced and those who were located in a time zone that accommodated the meeting time would jump into our weekly conference calls, and those unable would get the meetings notes with action items allocated to each person. And if someone had created something to be reviewed by someone else who was unavailable due to the time difference, I would work with them on a separate channel on the platform. I was never left hanging, and everyone responded when they could, and as well as they could. Regardless of where each member is located, the constant is our all-hands-on-deck approach: whenever something needs to be done, someone rises to the occasion. Whenever food needed to be delivered from a bakery to the venue of a convention (including prestigious and logistically complex places like the Condé Naste Building, which we used for the New York convention), or searching for an event space, the task would be opened up to all of us, and eventually someone would jump in. This model of open collaboration applied at the organization-wide level, but also as we broke off like cellular growth into smaller committees, including, marketing, the committee I was on. This process of opening up challenges to a community is a form of open innovation, in which important decisions are decided on by a passionate community rather than just to closed rooms of stakeholders. Research has shown that open innovation is conducive to the kind of unexpected associations that spark creative thinking, as I wrote in an earlier post. In his brilliant TED talk, innovation consultant Charles Leadbeater uses the example of mountain bikes to make his point about collaboration. A community of bikers in Northern California were frustrated about the flaws of racing bikes and recreational bikes, so they came together and invented the mountain bike by mixing and matching the best of both when the big corporations in the biking industry only saw risks in doing so. Today, the majority of bikes sold are mountain bikes. Mountain bikes, Wikipedia, rap music, and other game-changing things in our culture were born from the collective creativity of passionate communities, often working outside the corporate world. 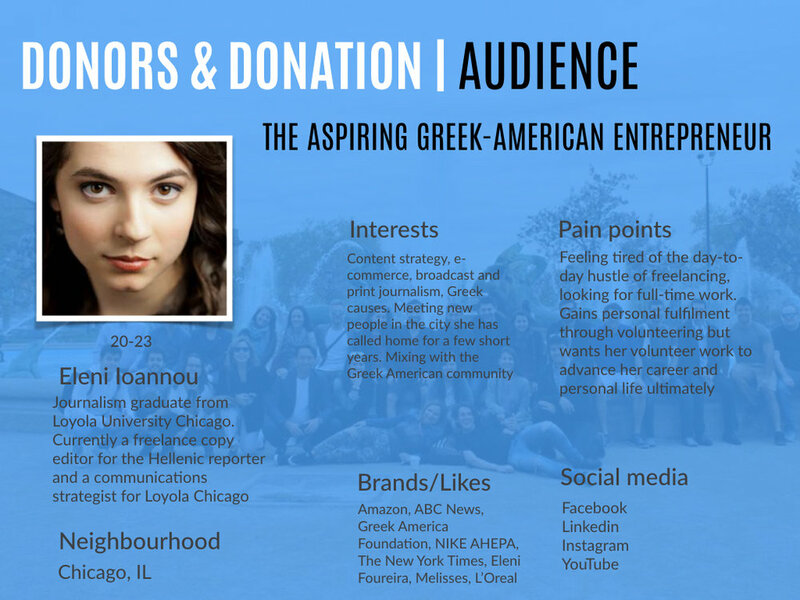 NHSA’s open model of collaboration, and engagement with its community are reasons why I admire this organization and its vision for a collaborative future for Hellenic organizations and beyond. The bedrock of the collaboration that happens at NHSA is, of course, the culture that unites us. Our shared story as Greeks, and our willingness to use that story to elevate each other, and learn from our differences, are some of its greatest strengths. 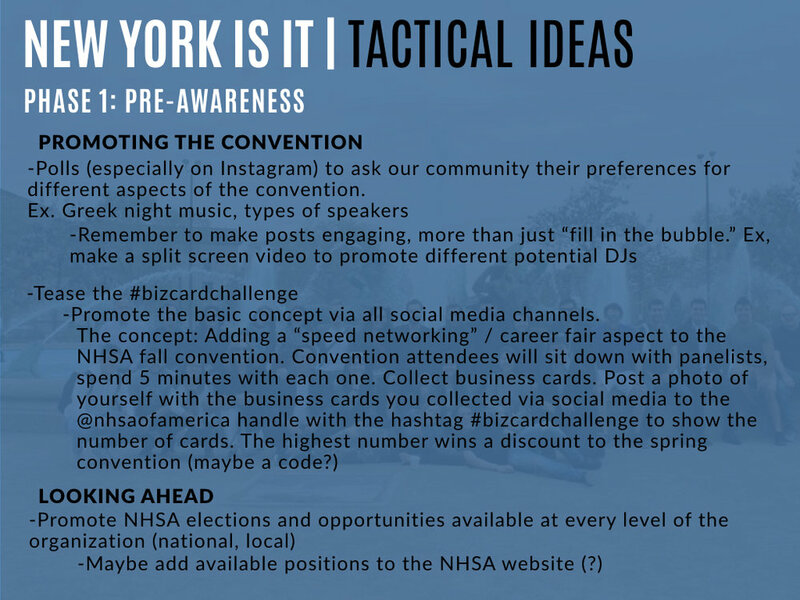 The process of developing the marketing strategies I created for the New York convention was an exercise in finding common ground. 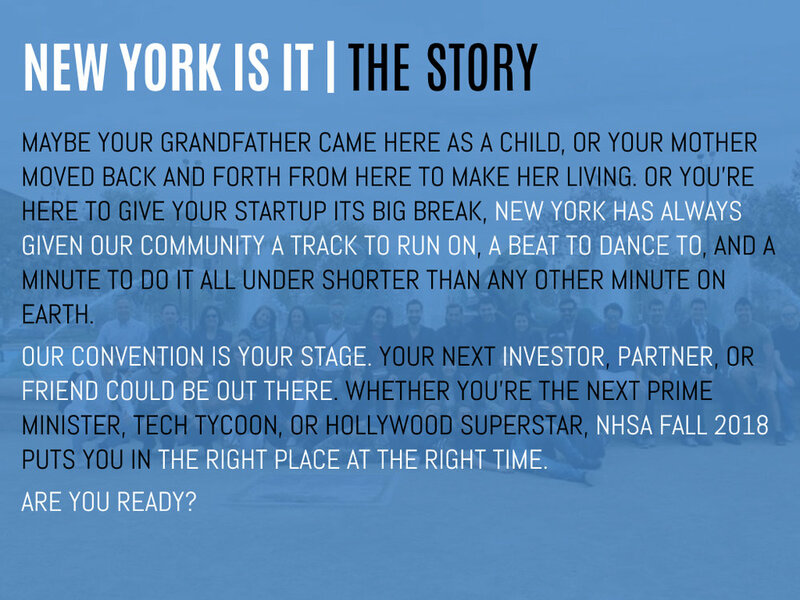 In the strategy presentation I put together, I decided the common denominator of New York and Hellenic-Americans is the story of immigrants to Ellis Island who searched for a better life. I identified parallels between today’s young Hellenic professionals who job hunt in a new city and the experience of our brave ancestors—including my own— which became core to the promotional strategy for the convention. 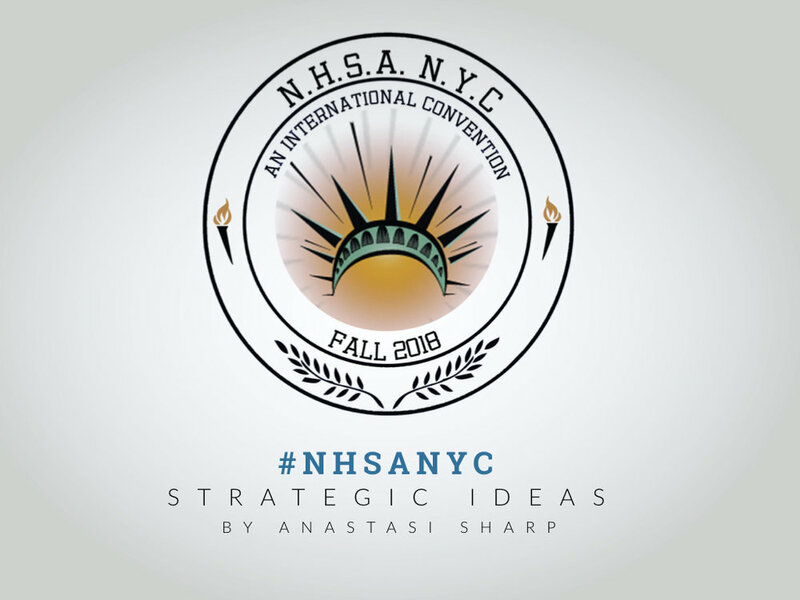 Excerpts from the strategies I devised for the NHSA convention. See the full presentation here. Collaboration between members of NHSA was also an exercise in finding common ground, and using our differences as strengths that ultimately fostered an inclusive experience for everyone who attended the convention. 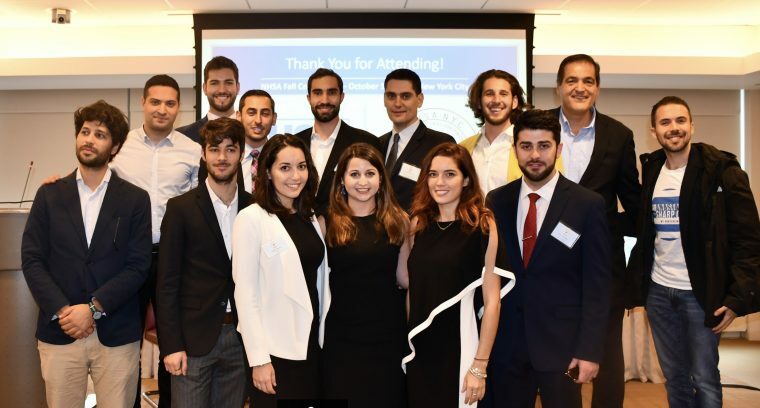 The full spectrum of Hellenic experience is represented in our organization, with members from or descended from Greece and Cyprus who live around the world. The choice of music on the Greek night (the after party on the night of the convention) is a discussion where our differences may have influenced each person’s choice of music, but the sum total of our opinions made us stronger. Having grown up in Greece, I can say I was exposed to equal doses of Greek pop and folk music, whereas others had a strong preference for one of the two genres. In the end, we decided on a blend of both, a choice we suspect pleased everyone’s ears that night at Kellari (a chic midtown taverna). Suffice it to say the exit door to the place was left unused until the wee hours of the morning. NHSA proves that shared experience and diversity within an organization are not necessarily at odds, and our range of viewpoints across the gamut of Hellenic experience brings with it all the benefits of diversity we hear about today. The Greek night itself also brought out our shared experience. From the first note of Απόψε Στις Ακρογιαλιές (Tonight on the Coastlines), that disarmingly simple Kalamatiano dance familiar to many of us since childhood, began to form as we held hands in a circular formation that never closes because it knows no strangers. I saw many singing the words to popular songs like Ξημερώματα (dawn), regardless of how well they knew the language or where they were from. Greek song is a homecoming of sorts, and it welcomes everyone, as it did that night. At the actual convention, after the speaker panels ended, we broke for a speed networking lunch hour, where the convention speakers sat with convention attendees at tables organized by field (medicine, law, business, etc). As I looked around, I realized that our shared story was the reason why every mentor was there in the first place. One of those mentors had taught my brother and Alex when they were students at ACS, the international American high school in Greece that I also attended for over a decade (more about that here). I’m convinced she would never have joined us if she had not shared our story bound by our culture and experiences. Another mentor, whose table I sat at during the networking lunch, is a renowned journalist and lawyer who has anchored for WCBS Newsradio, CNN, CNBC, and interviewed various heads of state. In an interview with the Greek National Herald (known to generations of New York area Greeks as «Εθνικός Κύρικας»), he talks movingly about the impact of his Greek upbringing on his life’s work. Perhaps those memories of starting out put him in the wing-tipped shoes of the likes of me: Greek-Americans trying to make it in a big new city. Striking poses with convention speakers, mentors, and executives. Included also are scenes from the networking lunch hour and the speaker panels. Remembering and mining this common ground is so important, because it builds trust and friendship within organizations and among people. Common ground is important as a shortcut to reaching trust. Behavioral economist Dan Ariely, who has done brilliant work on the topic of trust, says trust is crucial to any organization or a society, because trust reduces the complexity of processes, and ensures everyone gets their due. But trust is fragile, and it must be nurtured, which is why the efforts we make to explore our common ground and build trust and our community must be sustained in order to work. The New York convention reminds me that the way forward for us Greeks is together. The culture of our heritage has produced exceptional individuals who have made us proud. Film directors, are crucial as visionaries, but they are part of creative teams that make movies happen. Similarly, we should celebrate and encourage exceptional Greek teamwork as much as exceptional Greek individuals. The Greek shipping industry comes to mind, an age-old business that captures the popular imagination as much as the sea that surrounds Greece. The staying power of Greeks, who have continued, since antiquity, to hold one of the world’s largest and most successful merchant fleets, is living proof of what our teamwork can do. The 2004 Olympics, despite the challenges that arose, were a dazzling display of collaborative creativity that captures our awe of Greece’s great past, promising a bright future. For me, both examples involve teamwork that stepped into our shared imagination, and then took a step outward (as we do in some of our dances) to draw from our hive mind as the wellspring of our greatest future. NHSA, for me, embodies this team spirit that could serve as a model for organizations on a larger scale. Archimedes famously said “give me a place to stand, […] and I will move the Earth.” If we Greeks follow the lead of NHSA and stand together, is there anything we can’t move next? With the convention speakers, mentors and executives. Photo courtesy of NHSA of America.